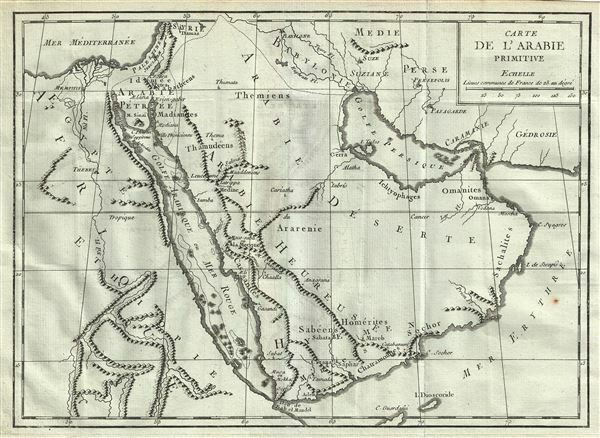 This is an interesting 1782 map by Jean- Baptiste-Claude Delisle de Sales, rendering Arabia, Ethiopia and Egypt in antiquity. Centered on the Red Sea (Golfe Arabique or Mer Rouge), this map covers the entirety of the Arabian Peninsula, the Persian Gulf and the Nile Valley as far south as Ethiopia. The map identifies the sites of forgotten towns, villages and the disposition of lands in the region. Ancient cities of Babylon and Thebes are identified, among others. This particular example used archaic place names. The map also notes rivers and topography, with mountains beautifully rendered. Mt. Sinai is identified. This map was issued as part of Delisle de Sales' Histoire des Hommes. Partie de l'Histoire Moderne. This volume is exceedingly rare as most of Sales' work was burnt under the censorship of heresy. Jean-Baptiste-Claude Delisle de Sales or Jean-Baptiste Isoard de Lisle (1741–1816) was a French philosopher, historian, and accused heretic active in the late 18th century. Sales is best known for his publication of the multi-volume opus The Philosophy of Nature: Treatise on Human Moral Nature. The work, among other ideas, challenged the Biblical theory that the earth was created in 4004 BC. Instead, Sales put forth the theory based upon astronomical observations, that the earth was 140,000 years old. Sales' revolutionary ideas caused him to be declared a heretic by the Catholic Church. His publications were subsequently censored and, for the most part, destroyed. As a consequence all of his works are today extremely rare. Sales was also, notably, a close friend of Voltaire who in 1777 visited him in prison, gifting him 500 pounds towards his release. Delisle de Sales is unrelated to the more famous De L'Isle family of cartographers. Delisle de Sales, Histoire des Hommes. Partie de l'Histoire Moderne, (Paris) 1782. Very good. Minor wear along original fold lines. Original platemark visible. Blank on verso.